For additional information about this book, visit the website www.kfjones.com. Due Unto: Denmark Vesey’s Story are woven from threads of history. The haunting beauty of the ancient African jungle is invaded by 18th century reality when a king’s warriors attack a village like a violent monsoon in pursuit of their goal—the capture of Africans from the interior for sale to Europeans at the coast. Separated in the Caribbean, Telemaque, soon renamed Denmark, is bound for Madame Chevalier’s unchartered atoll where he learns what he needs to survive a modern jungle. Koi, as practical as beautiful, is sold to a Jewish businessman, Adam Wolff, a smuggler with West Indies roots and an international reach, and brought to Charleston. Their lives follow the fortunes of revolutionaries struggling for and with independence and the dichotomy of liberty amid the bonds of slavery. When everything he holds dear is threatened Denmark must ultimately answer the question, to what extremes will he go to protect his family, his life? This riveting historical epic of love and family, war and loss, triumph and tragedy defines an era through a vivid cast of characters who will live on in the imagination of readers for years to come. 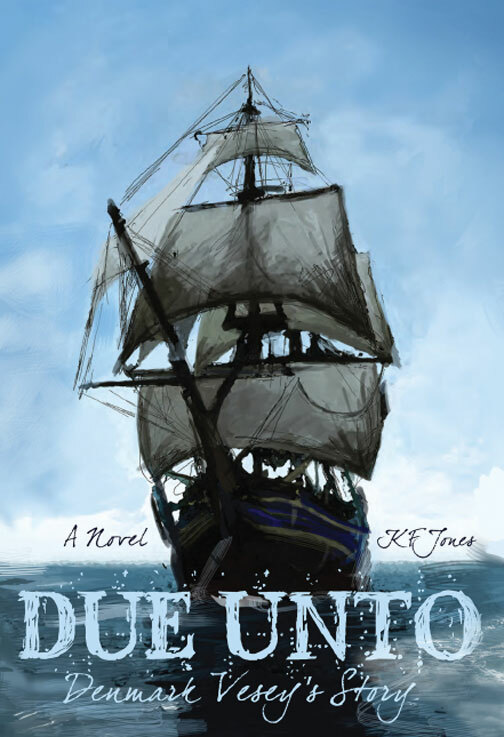 K. F. Jones is an Amazon Breakthrough Novel Award semifinalist and former teacher who taught students with learning disabilities the thrill of discovery through history and literature. Born in Louisiana, the author now lives in North Carolina.